Kids Growing Strong has been supporting youth gardening groups in California since 2001. Sue Bennett, an active rosarian and garden club member, became interested in Kids Growing Strong and became a volunteer for Kids Growing Strong and long-term supporter. Sue became President of California Garden Clubs, Inc. in 2015 for a two-year term (2015-2017). As her “President’s Project,” Sue developed the Encouraging Future Gardeners program to promote the joy and wonder of gardening among children and their families throughout California. In partnership with Kids Growing Strong, Sue developed an assortment of “kits” designed to appeal to different interests. During her term as president, Sue was able to distribute nearly 13,000 free kits to the public with the financial support of the members of garden clubs throughout California. Unfortunately, all good things come to an end… and so did Sue’s term as President of California Garden Clubs, Inc. Effective July 1, 2017, the Encouraging Future Gardeners (EFG) Program will continue its partnership with Kids Growing Strong (KGS). However, without outside funding, the program will no longer be able to offer kits fir free. There is a nominal $1.50/per kit fee to cover the cost of kit materials plus shipping expenses. A link to the Order form is below. To offer imaginative “gardening kits” designed to spark an interest in plants and inspire them to embark on a lifelong adventure in gardening. To provide opportunities for families to work together to discover the joys and wonder that gardening can bring into their lives. To offer resources to support teachers in their efforts to teach their students about plants, growing food, and other lessons that can be fun to learn in a garden. There are five different types of kits available. Includes seeds for planting herbs, planting guide, colorful 5”x 7” nutrition information cards, information about CGCI and ideas for creating recycled planting containers. Herbs are easy to replant into appropriate containers for kitchens or outdoors. Everything is wrapped up and ready to be used to start an indoor herb garden at home. 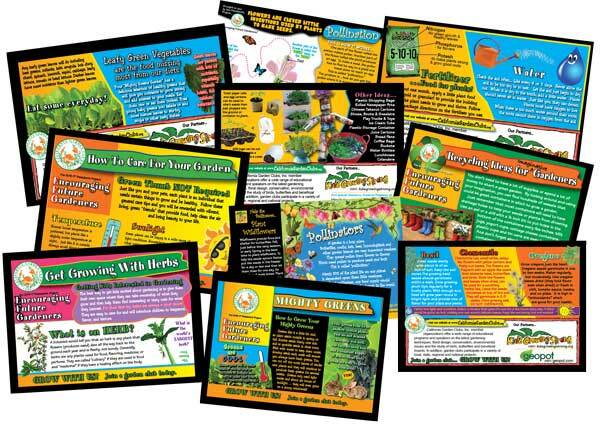 Includes a variety of lettuce/greens seeds, colorful 5”x 7” information cards, including ideas for creating recycled planting containers. Everything is wrapped up and ready to be used to start a fresh salad garden. Includes bean seeds (Fabraceae family) and radish seeds (Brassicaceae family) that make up two separate projects; one to create a “bean necklace” and one to make a “Magic Sprout Box.” The kit also includes 5”x 7” information cards, including ideas for creating recycled planting containers. Everything is wrapped up and ready to be used for 3+ years old to watch the seeds sprout. Includes three different seed cards from the following list, depending on the time of year. Seed packets are attached to each card – Beans, Beets, Broccoli, Carrots, Kale, Peas, Radishes, Squash, Sunflower or Tomatoes. These seeds are meant to be grown in a bigger area and don’t like to be transplanted. Illustrated planting guide, colorful 5”x 7” information cards, including ideas for creating recycled planting containers. Everything is wrapped up and ready to be used to start a fresh vegetable garden at home. Includes “Seeds for Butterflies,” or “Seeds for Pollinators”. An illustrated information/instruction leaflet, pollinator masks and an assortment of colorful 5”x 7” information cards, including ideas for creating recycled planting containers. Everything is wrapped up and ready to be used to create an outdoor garden that fosters pollinator habitat. Find out if your local library or book store has a reading hour with kids. See how the kits can be integrated into the reading hour; such as a discussion on good bugs in the garden and then request the appropriate number of Pollinator Paradise kits. Check out your local Community or Public Gardens to see if they can integrate the kits into a workshop or open house program. A good kit here would be Plant a Rainbow Kit; where kids plant carrots, broccoli and beets. Work with your local day care centers explaining Educating Future Gardeners and let them know you would be excited to work with them. Leave an order form/donation form in case the owner would like to place an order. Work with your local church with Sunday School. Ask them to integrate the kit into their program. Bring one of each kit for a “show and tell” along with an order form/donation form in case the teacher would like to place an order. Same goes for after school programs. The kits are not intended to be a mass hand-out at schools. We have found that handing out “FREE” kits has not proven to be the best way to make the kits useful. Things obtained for free, (especially “handed out” at schools) are perceived to have little value and end up sitting around in back packs and then thrown away. We find it much better to make the kits “special” — by making them special rewards for kids who might, for example, work hard at a garden that day…. make a great observation or participate well in some activity. Otherwise, the kits need to be introduced by a garden club member, Kids Growing Strong Leader or other registered, youth garden coordinator. The kits are appropriate for different ages and abilities. For example, the “Watch Us Grow” kit is only appropriate for kids in pre-school and up to about age 5. We prefer that one kit be given per child so we know how many children we reach. It is not meant to give five kits to one child. If you know someone in Girl/Boy Scouts, 4H, or other youth group…give them one. Better yet, ask for the name of their leader and talk with them about the kits to see which one can be incorporated into an activity.